State of the World 2013 Is Sustainability Still Possible? to sustainability as more than just a marketing tool. InState of the World 2013: Is Sustainability Still Possible?,experts define clear sustainability metrics and examine various policies and perspectives, including geoengineering, corporate transformation, and changes in agricultural policy, that could put us on the path to prosperity without diminishing the well-being of future generations. If these approaches fall short, the final chapters explore ways to prepare for drastic environmental change and resource depletion, such as strengthening democracy and societal resilience, protecting cultural heritage, and dealing with increased conflict and migration flows.State of the World 2013cuts through the rhetoric surrounding sustainability, offering a broad and realistic look at how close we are to fulfilling it today and which practices and policies will steer us in the right direction. 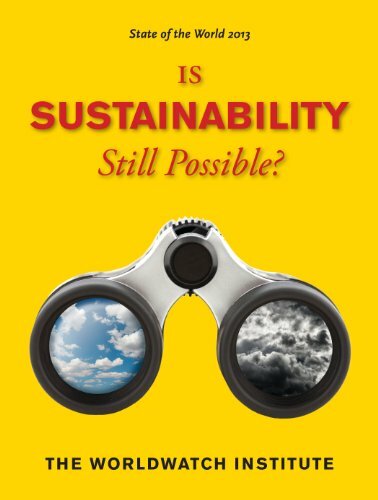 This book will be especially useful for policymakers, environmental nonprofits, and students of environmental studies, sustainability, or economics.